• Mix together water, oil, flour, salt, sugar, and yeast using a stand mixer with a dough hook. • Put dough in a warm place for approximately 2 hours. (It should be 2 to 2½ times in volume). • Meanwhile mix together ground meat, spices and water. • Put the finished dough onto a well floured cutting board, dust the dough with flour and with well-floured hands, shape it into a large log. • Cut off pieces one at a time about ¾″ thick. • Place the piece of dough over your well-floured hand (dough will be sticky) and shape it into a 3″ to 4″ circle using your hands. Do not put flour on the side where you are going to put the meat, otherwise the sides won’t seal. • Place 1 heaping tablespoon of meat filling in the center. 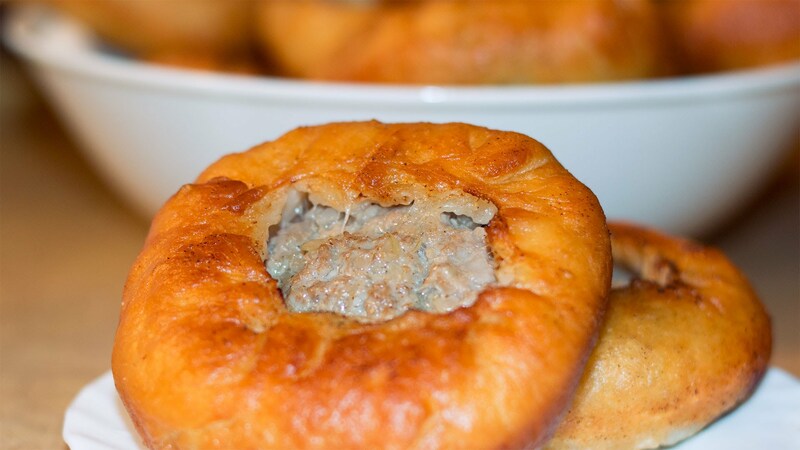 • Cover the meat with the sides of the dough, leaving a hole in the middle. Flatten the belyashi slightly to make them a more uniform size. • Heat oil in a large, deep, heavy-bottomed pan or cast iron dutch oven. There should be enough oil to cover the pirojki half-way up the side. • Place cooked belyashi on paper towels to soak in extra oil. This pie is delicious! I got the recipe from the chef in one of my favorite pubs in London.